With the weather warming up, the District kicked off months of pothole repair efforts Monday morning with what is expected to be a larger-than-usual annual “Potholepalooza." See photos. There’s a promise of relief to at least some commuters who have faced wild rides bouncing off potholes or zigzagging around them the last few months. Road crews in Maryland and Virginia also ramp up work in the spring. 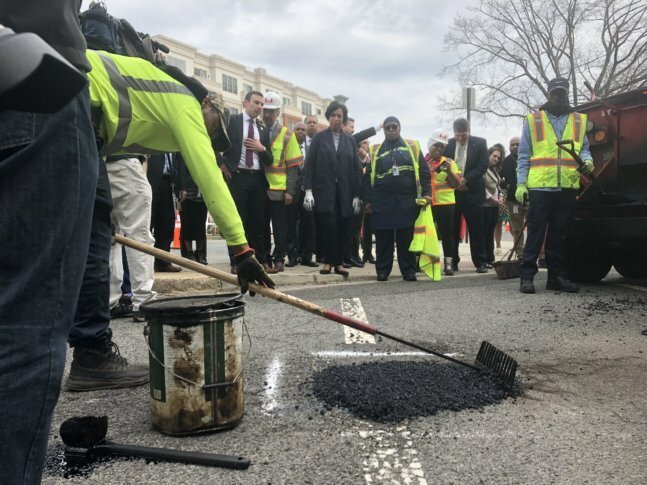 “The region has experienced record rainfall last year in 2018, which has created what looks like a record number of potholes,” D.C. Mayor Muriel Bowser said before helping tamp down freshly scooped asphalt to fill a pothole on G Street Northeast. Though it may not feel like it to some drivers, the District Department of Transportation said its crews have already filled more than 22,000 potholes across the city in just the last three months. Drivers who notice potholes on D.C. roads can report them by phone or online to 311 for repairs. The rain last year coupled with the freezing and thawing this winter is what has created the unusual number of potholes this season, he said. Marootian promised to get to potholes as quickly as possible, but could not say exactly how long it will take to get roads closer to normal. The District does sometimes pay drivers for damage from potholes on the city’s roads. “Whether you are driving a car, or whether you’re on a bike, or I guess even a scooter, these potholes are big, and I know I’ve hit a couple of rim-rattlers myself,” D.C. Council member Charles Allen said. Given all of the needs on the city’s roads, Bowser said she has no interest in taking extra responsibilities for roads operated by the National Park Service as Maryland Gov. Larry Hogan has suggested in his state for the Baltimore-Washington Parkway. Hogan wants to take over the road to add toll lanes. Bowser is working with the National Park Service to address road conditions on roads such as Rock Creek Parkway and in Fort Dupont Park where repairs are ongoing, but believes it is the federal government’s responsibility. “We are not really looking to take on any federal roads at this time,” Bowser said. WTOP’s Max Smith reported from Northeast D.C.